This is the ideal and best way to improve your brakes. Please Note that all Front Lines come in Racing Format. For twin disc both brake lines run directly from the master cylinder on to each caliper. A double width Banjo bolt is needed at the Mastercylinder. Banjo Bolts sold Singularly with 2 copper Washers. 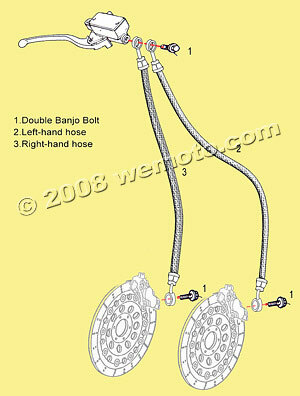 Please Remember to buy 2 Caliper Banjos and bolts if needed where you have twin front discs.